SPOKANE, Wash. – U.S. News & World Report ranks the Providence Sacred Heart Medical Center/Gonzaga University Nurse Anesthesia Program the 18th best (tie) graduate nurse anesthesia program in the nation. 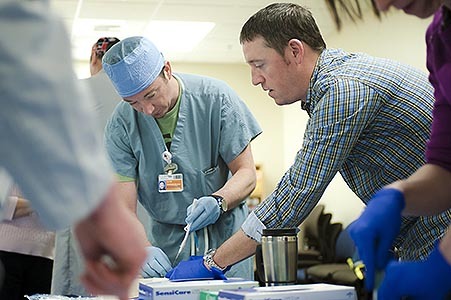 The innovative nurse anesthesia doctoral program focuses on clinical anesthesia and leadership. The rankings, released today, are in the U.S. News’ 2017 edition of the book “Best Graduate Schools” in the “Best Health Schools” section. View the list online. The health discipline rankings are based solely on the results of peer assessment surveys sent to deans, administrators and faculty at accredited degree programs or schools in each discipline. Respondents rated the academic quality of the programs. Dorothy Ruzicki, Ph.D., R.N., director of education for Providence Health Care in Spokane, said she is pleased with the recognition. Brenda Stevenson Marshall, dean of the Gonzaga School of Nursing and Human Physiology, said the recognition reflects the joint commitment to health care excellence from program partners Gonzaga and Providence Sacred Heart Medical Center & Children’s Hospital. “The unique relationship between a major health care system committed to excellence in patient care and an academic partner committed to excellence in education is a major contributing factor to the program’s ranking nationally,” said Stevenson Marshall. Accredited by the Council on Accreditation of Nurse Anesthesia, the program provides a doctorate in nurse anesthesia practice. In addition to preparing students to be competent, skilled nurse anesthesia practitioners, the program aims to nurture and develop innovative, creative leaders for the advancement of the profession of nurse anesthesia. For more information, visit http://www.gonzaga.edu/academics/colleges-and-schools/School-of-Nursing-Human-Physiology/DNAP/default.asp or contact Shannon Zaranski at (509) 313-3569 or Liz DeRuyter at (509) 474-3081.